The Client Area is the starting point for all interaction with your One World Hosting account(s), settings, contact and billing information. �To access your own Client Area, start with�https://oneworldhosting.com/support/clientarea.php - you can also log in from the footer of any page on our site. 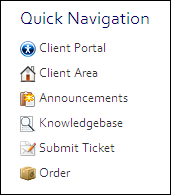 Please note the wording on that page - your Client Area login is your email and a password which will be different from any specific control panel (or FTP) password. �If you can't find or remember it, use that Password Reset link to obtain a new password. 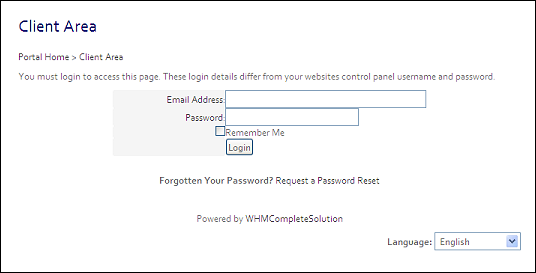 Now you can log directly into your control panel (cPanel) to access all of the tools and settings for your hosted account, and also Webmail for access-anywhere email. 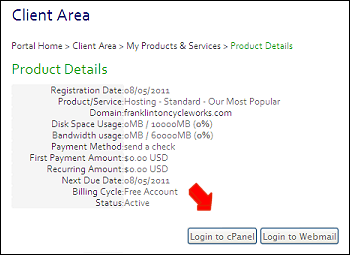 �Below this area you'll see the current cPanel password, options to update it, and some addition package information. Every hosting account cPanel can be accessed directly, without going through the Client Area, by simply visiting the URL yourdomain.com/cpanel, but by using the Client Area you can access everything from one point - accounts, tickets, and every other detail you need! You can learn more about reselling in our main�Reselling page.